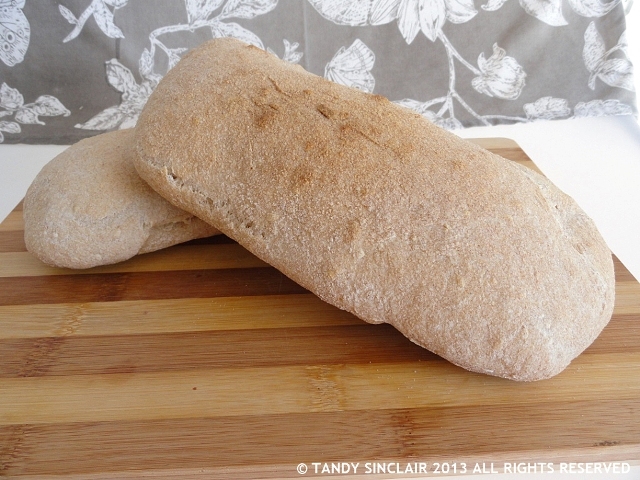 I am submitting this recipe for Sourdough Ciabatta to Fresh From The Oven which is being hosted this month by Utterly Scrummy Food For Families. Each weekend I try to bake a new type of sourdough loaf in order to get the feel for how the dough works and to change things up a bit in my house. I am not a huge fan of ciabatta loaves as I find the crust to hard and usually end up cutting the top of my palate. In fact, even when we are in Italy I tend not to buy ciabatta. However, reading Celia’s recipe I realized that it is the baking time that affects the crustiness and so I decided to give ciabatta a chance. The first loaves I made were nothing like ciabatta and might have had everything to do with the fact that I relied on my memory and did not follow the recipe when making the loaves. Not only did I make use of tap water, I also added oil! Then last weekend I decided to follow the recipe, but instead of using semola flour like Celia, I used 00 pasta flour. This is very fine and added a very soft texture to the ciabatta. This weekend I used the semola flour so that I could get a comparison between the two before posting a recipe for this month’s Fresh From The Oven challenge. Personally I prefer the softer loaf, but please take a look at Celia’s recipe for the original! do you like soft or crusty loaves of bread? Your Ciabatta looks delicious! Thank you so much for linking up with Fresh From the Oven. Dear Tandy, I am experimenting a lot with bread lately. I must say that I love ciabatta bread and I am trying to find the right recipe. I like this version with sourdough…unfortunately my starters keep dieing…I am waiting for the warm summer to make a new starter and bake delicious bread (PS I use strong white flour for bread/focaccia). I love sourdough, but so far have not baked any sourdough bread…yours look great Tandy…as for me depends on the kind of bread, I can go with soft or crusty. I was lucky enough to try some of Celia’s ciabatta tonight and it is deeelicious! 😀 I love seeing how much fun you’re having with baking! It looks good. I love a crusty bread but not the ones that hurt my mouth. Exactly how I like the loaf and for the same reason! Thanks, James ate the entire loaf bar a few slices in one go!